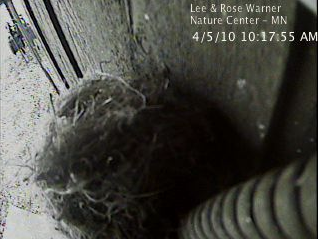 Every year we have Eastern Phoebes that nest at the nature center where I work. I know of at least five locations where they nest on the property and I'm sure there are more. 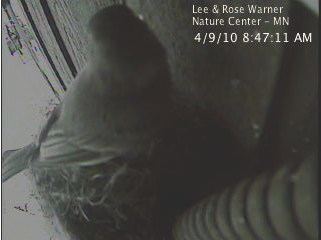 The photo above is of an Eastern Phoebe shortly after it showed up this spring. I took this photo out the window of our front entry way. I was excited to see a phoebe in this tree as it is the closest tree to a nest that has been occupied for several years. 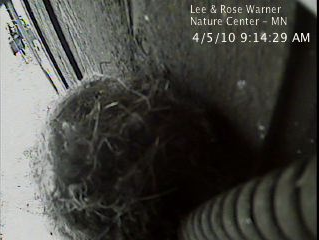 This is also the nest we have wired up with a nest camera in a joint project with the Cornell Laboratory of Ornithology. The camera is not "live" yet but I have access to the images. 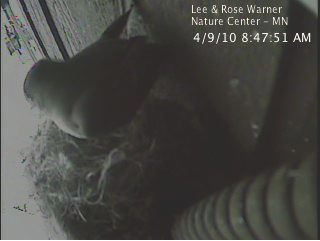 I thought I saw the bird fly to the nest on April fifth but by the time I got to the computer to look there was nothing on the nest. I checked an hour later and it did look like some things had been moved a bit. Interesting but not conclusive. 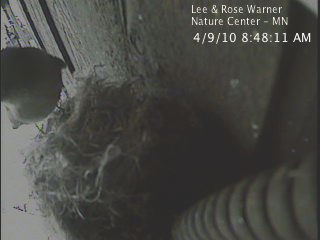 This time of year the phoebes are still checking out possible nest sites. Eastern Phoebes are one species that will reuse nests from previous years. This morning, one of our naturalists, Kelly Amoth, came to me and said she had just seen a bird fly to the nest. I quickly brought up the webpage and sure enough there was the bird. It was captured on at least three screen grabs and the camera takes them every 20 seconds. This is a good sign and I hope the pair of birds hanging out near this nest choose to use it. I'll be sure to keep everyone up to date on what happens with the nest.